Ever feel your home look more flatpack than fabulous? Trick out your pad with a few key pieces from this store. We were walking around Lake Market area when we stumbled across this bright and colorful store (opposite the Hanuman Mandir on Jadunath Sarkar Road). It stocks hand-crafted, solid wood furniture sourced from across the country. The piece are made from teak, mahogany, sheesham and mango wood. Each piece is unique and handcrafted. Negotiate the tangle of chests, tables and accessories across the rooms. They stock three different ranges you can choose from. 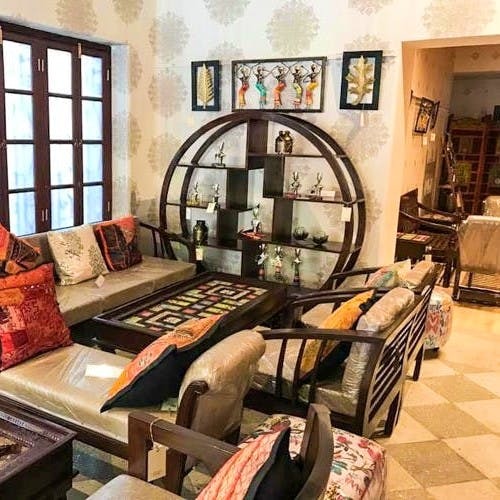 Colours — trendy, ethnic pieces to brighten up any corner of your home; Classic — their range of hand-crafted, colonial furniture, made from teak and reminiscent of the days of the Raj; and Unique — a contemporary line. You’ll find beautiful and unique pieces here. You will love the collection of comfy chairs — especially the rocking chair (around INR 19,000) which you can perfectly cosy up in with a book. Looking for a chaise lounge for your living room? They have several styles — from a very Rajasthani look with colorful patchwork (and pullout drawers) to simple-yet-chic ones in cream or pastels. Or you may just might find yourself picking up this partition in eye-popping red that you feel you suddenly need for yourself. This gorgeous cabinet in dark wood with inlay work is versatile, practical and aesthetically pleasing and is perfect for a study. Looking for a table? They have huge range of styles here. Looking for the perfect wedding gift or something for your BFF's griha pravesh function? YOu will find something here for sure.